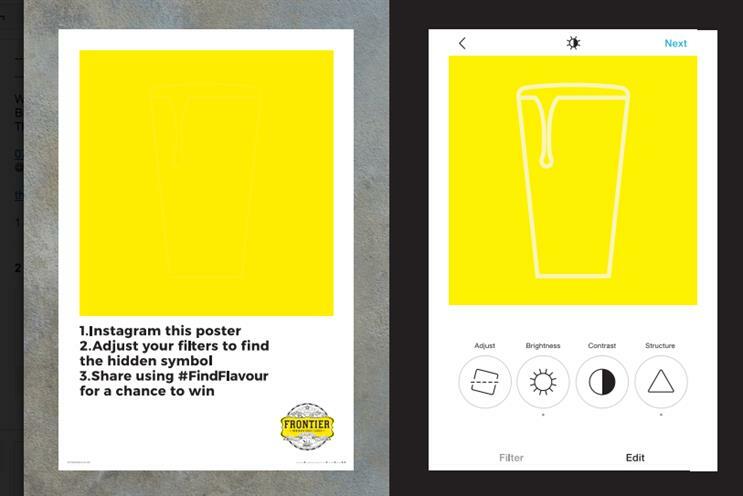 Frontier, the craft lager brand by Fuller's, is inviting passersby to take pictures of seemingly blank outdoor posters that reveal hidden messages via Instagram. The fly-posters, created by The Corner, each have an image or message embedded in the artwork and gives a call to action to enter a win a prize draw. The ad was created by Matthew Lancod and Robert Amstell at The Corner, which says using Instagram's image filters to reveal hidden messages is a social media first. The media buy, handled by UM, includes 4-sheet flyposting sites in East London from today for two weeks. The campaign launched two years ago and Frontier is now Fuller’s second biggest brand in the UK, behind London Pride. Jane Jones, head of marketing at Fuller’s, said: "Our latest wave of the ‘Find Flavour’ campaign directly interacts with our curious Frontier fans who we know love exploring new experiences and tastes. "The Corner has created an ingenious execution which combines social media with the real world to reflect the fun and adventurous elements of the Frontier experience."